I wrote this piece for the Dallas Morning News. It was published on Dec. 12, 1999. Juan Miguel Gonzalez, a modest, small-town doorman, sat dazed as thousands of Cubans waved color posters of his son, Elian, suddenly the most famous first-grader in the Americas. The mass demonstrations in Matanzas and 16 other cities Friday were the largest of their kind ever held on the island, Cuban officials say. More than 2.2 million Cubans – a fifth of the population by government estimates – streamed into parks and plazas to demand that 6-year-old Elian be returned to his father. Cuban President Fidel Castro has vowed that “heaven and earth will be moved” to get the boy home. Fishermen found the boy clinging to an inner tube off Florida’s coast on Thanksgiving Day after a voyage that had killed his mother and nine others. Almost overnight, the shy boy was thrust into the center of a bitter custody dispute laced with all the venom of Cold War politics. On one side are the Cubans, who say the boy belongs with his father, a Communist Party member who lives in Cardenas, a town of 95,000 east of Havana. On the other side are the boy’s relatives in Miami – and a host of Communist-hating exiles – who say U.S.-style freedom for the child is more important than the father’s rights. On Friday, attorneys for the boy’s Miami relatives filed an asylum petition in Dallas that says the boy faces persecution if returned to Cuba. Immigration officials first must decide whether to formally admit Elian to the United States, a question that was deferred when he went to the hospital after being found in the ocean. That decision will come after a meeting on the boy’s fate that the Immigration and Naturalization Service has scheduled Dec. 23, said Roger Bernstein, a Miami attorney for Elian’s U.S. relatives. Even if the government decides Elian should not be admitted, perhaps because of the father’s custody claim, attorneys hope the asylum petition would block the boy’s return to Cuba. “There is a well-founded fear of persecution,” said Linda Osberg-Braun, another of the family’s attorneys. The asylum petition was filed at a Dallas INS center that processes immigrant applications from the southeastern United States. Elian’s fateful journey began Nov. 22 when he and his mother, Elizabet Broton, and 11 others climbed aboard a 16-foot boat and headed north. By the second day, the boat’s outboard engines failed, and it soon began to sink. The passengers clung to inner tubes, but one by one got tired and slipped into the sea, a survivor later told reporters. Only Elian and two adults survived. After his rescue, the boy spoke to his father by phone and told him he had seen his mother drown. In Cuba, the boy’s father said he didn’t know his ex-wife was taking their son out of the country. Mr. Gonzalez, 31, and Ms. Broton, 30, a hotel maid, divorced 31/2 years ago, but they had a “very civilized” relationship, Mr. Ramirez said. On many weekends, Mr. Gonzalez brought his son to where he has worked for the last 11 years, Josone Park in the seaside resort of Varadero, west of Cardenas. Tourists and locals visit the park for its lush gardens, lake, restaurants and swimming pool. Mr. Gonzalez let his son play there while he worked, greeting guests, showing them around and opening doors. The Cuban president also said that Mr. Romero had evidently made an illegal trip to the United States last year and returned to Cuba. Mr. Romero’s family couldn’t be reached. One of his acquaintances wasn’t quite as critical of him, saying he survived like many Cubans, selling things on the black market and getting money any way he could – “by inventing,” as locals put it. In Miami, exiles praise Elian’s mother as one who risked everything for freedom. Radio stations call her son “the last hero of the millennium,” and his new friends there have showered him with gifts, everything from portable radios to bicycles. On average, six Cubans every day secretly pack their belongings and board rickety smugglers’ boats bound for Florida. U.S. officials say people leave because of the grim economic conditions. Cuban officials blame a U.S. law that allows Cubans – and no other immigrants – to obtain legal residency if they’re able to reach American soil without getting caught. The number of Cubans willing to take the risk has risen in recent years. About 2,200 made the perilous trip across the Florida Straits from October 1998 to September 1999, up from 600 the previous year, U.S. officials say. But the tragic voyage of Elian Gonzalez has energized Cubans. “We will win,” Elian’s father, looking weary, told the crowd. Castro loyalists call the protests spontaneous outbursts. “These help strengthen the revolution, but it’s not planned that way,” said Marta Rojas, a prominent Cuban author. Others accuse the Castro government of staging the huge rallies to distract people from their everyday economic troubles. Back in Cardenas, the boy’s hometown, his grandmother is making him a uniform for karate class, and neighbors are guarding his house. Across town, the boy’s classroom – No. 21 at the Marcelo Salado Primary School – has been turned into a kind of shrine. 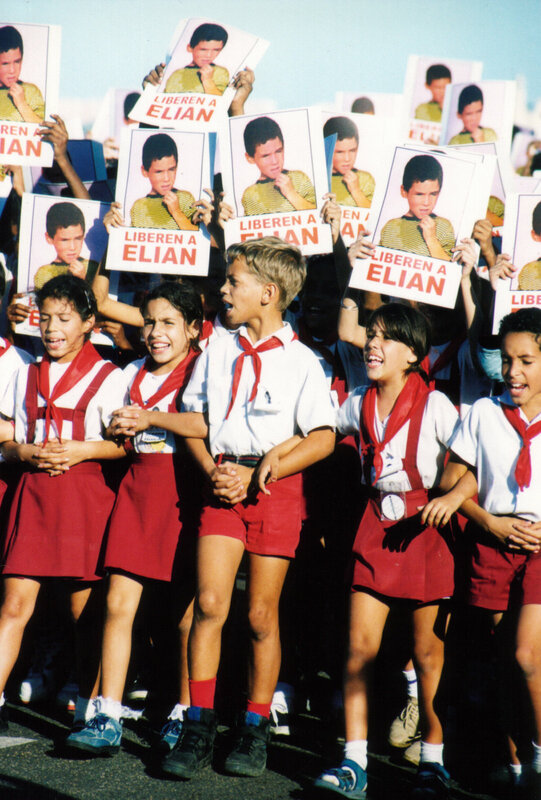 Students take turns looking after Elian’s books and desk, and locals file in by the hundreds to sign a book demanding the child’s return to Cuba. The boy began attending the 972-student school in August. “He is very timid, but intelligent. You have to push to get him to answer a question, but once he answers he has something to say. He’s very sensitive and usually got to school early, not late,” said his teacher, Yamelin Morales. “I gave him the job of sharpening other students pencils so he’d meet people and lose some of his shyness. He was cute walking around with his little sharpener, shaped like a crocodile. Staff writer David LaGesse in Washington, D.C., contributed to this report.